Whether you agree with his stands on issues or not, one thing is certain – Donald Trump disrupted politics. He was the quintessential outsider; his entry into the political area was treated with a combination of incredulity and contempt. His main challenger had over 40 years of experience in politics, he’d never held a political office in his life. But Trump was a successful and shrewd business man – with limited resources and against overwhelming odds, he trumped. He did it by treating his Presidential campaign like a startup. 1 The background: Startups often are small nimble entities that are trying to change how the world works. This involves pushing aside the existing world order. For years, US politics had been dominated by career politicians – Obama was a member of the Illinois senate before becoming President, George Bush was the son of former Prime Minister H.W Bush, and Bill Clinton had been the governor of Arkansas. 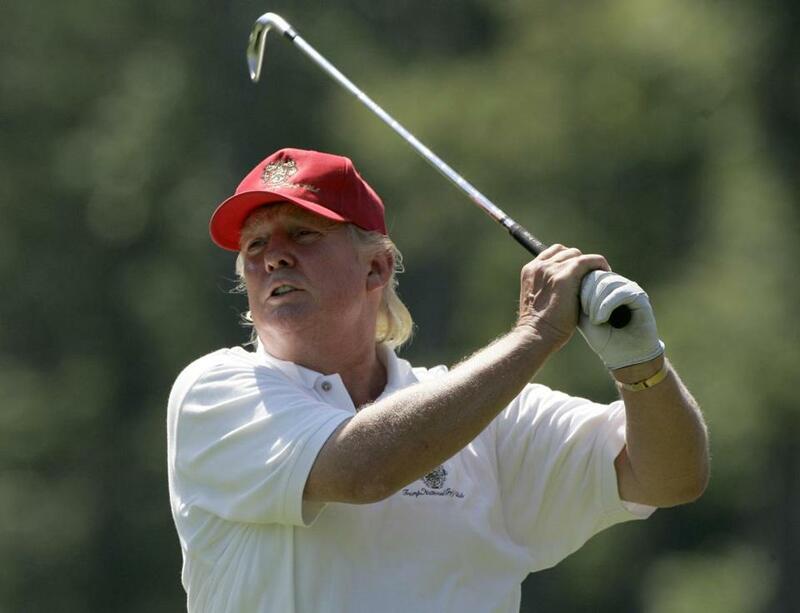 Trump had no prior experience in politics. As an outsider, he saw inefficiencies in how the system was run – he claimed that Washington was a web of complex interconnected relationships between politicians, lobbyists and special interests. He says he jumped into politics to change all that. 2. Launch with a bang: Trump was a well known celebrity before he even started his campaign – he was the star of The Apprentice, and his name was splashed across buildings around the world. But with the Republican race having 17 candidates, many with political experience, Trump needed to stand out. While announcing his nomination, he came up with a bold, if controversial statement – he said that Mexican immigrants coming into the US were “criminals and rapists.” There had never been a political candidate who’d said things like those, even if stats hinted in that direction. What followed was a media frenzy, and Trump dominated headlines like no other candidate on the Republican ticket. 3. Bootstrapped: Trump is worth an estimated $4 billion, and he put his own money into his campaign. Other candidates, both Republican and Democrat, relied heavily on donors. Trump highlighted this fact throughout, claiming he’d put his money where is mouth was, and his non-dependence on donors meant he was fighting for the American people. Trump said he wasn’t controlled by special interests, and won hearts with his approach – many of his voters cited this as the chief reason they supported him. 4. Get a loyal band of initial users first: It’s the mantra that startup gurus, including Y combinator members Paul Graham and Sam Altman preach – it’s better to be loved by a few loyal users, than being simply liked by a larger group. Trump’s rhetoric in the earlier days of his campaign won him a loyal band of followers. While they weren’t from the mainstream media, several influencers like Milo Yiannopoulos, and publications like Breitbart news became strident Trump supporters. Once he had their unquestioning backing, he was able to build his campaign around it. 5. Pivoting: A startup is a fast moving entity – strategies that work well in its early days won’t always work when it’s trying to scale. Trump had won the Republican nomination by making outrageous statements and being provocative. His rhetoric ensured that he won the Republication nomination, beating aside the other 17 candidates in the fray. But things were different once he’d become the Republican nominee – he’d already won over the Republican base, he now had to win over the independents and hope to convert some Democrats. He did this by acting a lot more Presidential – as soon as he’d won the Republican ticket, his tone softened, his message became a lot more inclusive. He’d campaigned for strict checks for Muslims and the building of a wall at the Mexican border – these talking points quietly took a backseat from his campaign when he became the nominee. 6. Using social media: Trump used social media masterfully. The mainstream media was staunchly against him, so he turned to social media to deliver his message. His rallies were broadcast live on Youtube and Facebook, and he managed to reach millions of people without spending much money. His Twitter account, cultivated over years of work (he had millions of followers before he even stood for President) became his mouthpiece. His social media team was alert, and used topicality and humour to get their message out. When Pokemon Go was a craze, Trump’s team released a ad showing Hillary as a Pokemon waiting to be caught. The Pokemon was called “Cheating Hillary”, and was responsible for deleting 33,000 emails. The ad was irreverent, funny, and drove home the message like nothing else. It racked up 12 million views on Facebook in a day. 7. Lean: And finally, Trump adhered to the smartest rule in the startup playbook – being lean. As of October 28, Clinton had raised $687 million compared to Trump’s $307 million—a 124 percent advantage. Trump had significantly lesser money than Hillary, but he chose to spend it wisely. Instead of buying expensive ad slots of television, he build a social media following. Instead of campaigning in states where he knew he had no chance, he chose to spend it on places where he could’ve conceivably win. 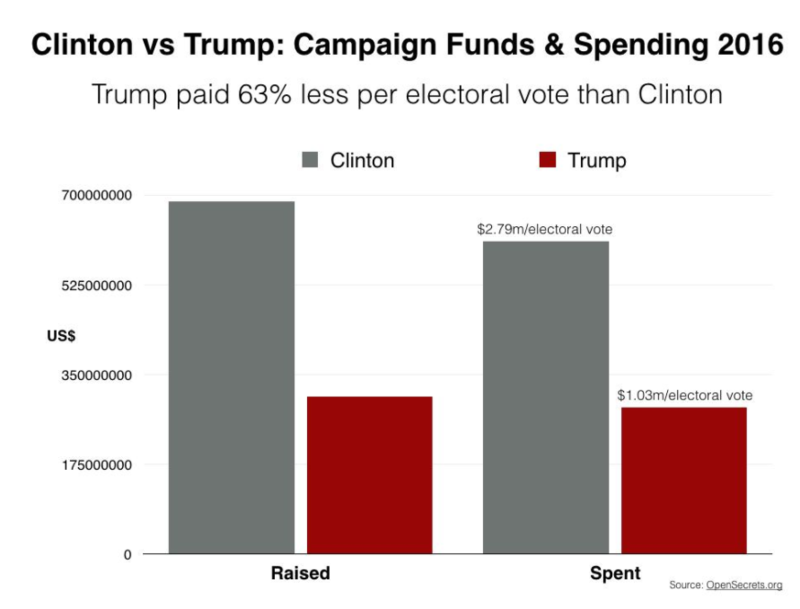 The results bore testament to his strategy – Hillary Clinton won more votes than him, yet he won; Clinton had spent more money than him, yet he won. He managed to get an electoral vote for less than half of what Clinton spent.